As I’ve mentioned before, pollution is something I never look forward to in Beijing. It was bad in 2005 when I was there in the summer, and it had become noticeably worse by the time I returned in late 2010. Most people – including local Beijingers – are well aware of just how bad the pollution is these days. This wasn’t always true. In 2005, anytime you brought up the pollution, e.g. “the pollution’s no good” (wuran bu hao) people would just say “the weather’s no good” (tianqi bu hao). As a foreigner who was not used to that level of pollution it felt like local Beijingers were in obvious denial. 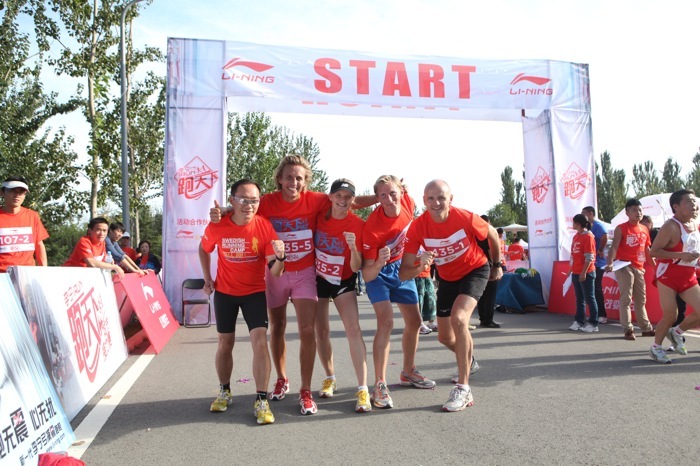 My main non-research-related social group in Beijing was the runners. They kept me “real” – or at least healthy and sane, particularly on days when research-related woes or archival red tape threatened to send me in search of booze. At the start of the Li-Ning relay race. Second from left is L, the (fast) distance runner and fitness program guru, and second from right is M, the fearless leader. Badachu park is just west of Beijing’s 5th ring road, south of the more popular and larger Xiangshan (Fragrant Hills) park. But we never actually went to Badachu. Once we got to the signs just outside the ring road that pointed us in that direction one of us (me or another Chinese speaker) would pipe up with “OK, now just go straight, then up there on the right – ting che (stop the car)!” In the middle of a few dilapidated houses and shops our group of 3-5 foreigners, all in full running gear, would hop out of the taxi and hand over our ~70 kuai fare. We’d then cross the road and pick up a small path behind a family-run smokes and liquor shop and just start jogging up the mountain behind it. When I first arrived in Beijing in late 2010 for a long-term stay, I dreaded having a similar experience to that of 2005 — namely, that the pollution would send all my running indoors. Running in Beijing can be very trying. I would argue that only the truly dedicated runners regularly run outdoors there. I determined from Day 1 in 2010, however, not to let that happen this time around. I did join a gym soon after arrival, but I moved a few months later to a location much less convenient, and the contract (like so many other things) was non-refundable. I’d paid a negotiated sum up front. But I wasn’t too disappointed: I’d moved closer to a group of expat runners (mostly Swedes) that I’d recently met and I knew I’d have other nut jobs like myself to run around with outside. When I first went to study Chinese in Beijing in the summer of 2005, I was a fairly avid triathlete. This posed some serious issues that, at the time, I didn’t really think were going to be issues — actually, that statement alone pretty much summarizes every experience I had that summer, from the miserable homestay experience that abruptly ended, to the realization that learning Chinese was going to be a hell of lot tougher than I imagined.